BBetsy McHugh is the Founder and Chief Product Officer at Hurdl, pioneering “the next generation of fan-based marketing” at live events. Event attendees get an LED wristband upon entering a venue, which can then be activated via SMS to answer a short set of questions. Those who choose to answer survey in turn become a part of the light show, get special offers, merch deals, and any other incentives determined by the artist’s team. The Nashville-based startup claims to identify 8 times the data on who is in the audience versus other methods (for the organiser to then start a conversation with those fans). The system has a 67% average audience opt-in rate with 95% of those who do so answering up to 5 survey questions. 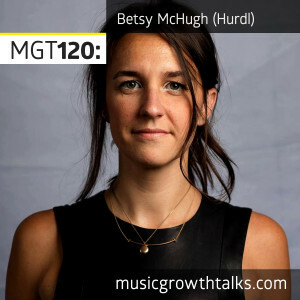 On this Music Growth Talks episode Betsy shares how acts like Deadmau5 and Why Don’t We have already benefited from the platform. Listen to the episode in full to learn about the new ways to enhance fan experiences at your live shows, and to hear Betsy’s take on the experience economy.